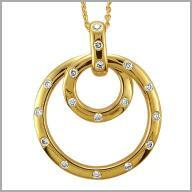 A chic and stunning circle design--the perfect accoutrement to your latest fashions. This pendant is crafted in satin and polished 14K gold. It features 17 full round cut diamonds. They are in burnished settings gracing the concentric circles and bail with precious brilliance.